There are a number of morbid attractions that are visited around the world every year. These attractions can be found in nearly every corner of the globe and they present new and peculiar places for tourists to visit. For those who have a hankering for the strange and morbid, the following attractions should not be missed. They represent some of the more gruesome and weird places that our curious world has to offer. The Czech Republic seems to be teeming with weird and wonderful places and it also boasts another incredible attraction for visitors with a hankering for the morose. 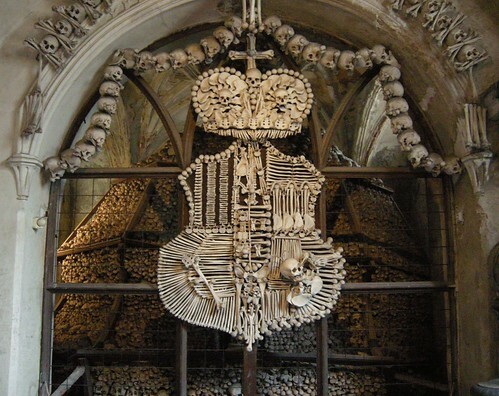 The Bone Church is very well known by the locals in the area but often steered clear of by many tourists, making it an even more curious place to visit. The morbidity of this attraction comes from what is believed to be inside the chapel. It is estimated to hold the skeletons of anywhere between 40,000 and 70,000 people. These bones are used for a variety of purposes throughout the building, including ghoulish pieces decoration and furnishings. Although the country has other morbid attractions, the Sedlec Ossuary is one of the most visited tourist attractions in all of the Czech Republic and still receives an incredible 200,000 visitors every year. The story behind the church is that there were too many people who wanted to be buried inside the churchyard and the church could simply not accommodate all of the requests. Instead, the bones of these individuals were used to build things for the church. One of the most well known of these is the chandelier that is made out of every bone in the human body. There is also a coat of arms that shows a crow pecking out the eye of a skull. For those who have visited, it is renowned as one of the most morbid and creepy places on Earth. There are several morbid and bizarre attractions throughout the United States. One of these is the museum of death located in Los Angeles, California. This attraction houses a number of dark and weird artifacts that can be viewed by tourists and visitors. Some of the more well known of these include a baseball signed by one of the biggest serial killers in the country’s history as well as hand-carved Tibetan funerary skulls, and a wooden embalming table that was used in the 1800’s. There are a number of incredibly fascinating, as well as morbid, items that can be viewed by the many tourists and visitors that make the visit to the Museum of Death. London boasts a morbid tour of its own, with a walking Jack the Ripper Tour. This guided tour takes tourists and visitors to the gruesome sites of the mass murderer’s killings. While the tour is known for its morbidity, those who have taken the walk also say that is very informative, making it thought-provoking for a variety of reasons. Spooky. Amsterdam is known for being an incredibly popular destination for visitors. It also boasts one of the most gruesome museums in the world in its Medieval Torture museum. This morbid museum houses a number of torture objects and devices in an atmosphere that is dingy, disturbing, and dark. It gives its visitors an idea of the criminal justice system from five hundred years ago. The articles on display include a variety of different contraptions that were used to torture different parts of the body through stretching, beating, and other methods. There are also several self-explanatory pictures and paintings strategically placed throughout the museum, which just adds to its morbid fascination for visitors. At Alton Towers we’ve been eagerly researching these creepy and morbid attractions in preparation for this year’s halloween scarefest. Hope you can make it! Not a place to take your kids, lol. Oh my word! I wouldn’t want to touch a thing! Oh my gosh, why would anyone want that chandelier?? I must love morbid things because I would LOVE to see each and every one of these. This is the most interesting and inspired blog post I have ever read! There are so many places that cater to the grusome! A lot can be learned from these places, even if they are weird. Thank you for sharing some of them with us! I know I’m a weird-o. I would love to visit each and every one of these places. Wow! I’m not sure I’ll be visiting any of these.